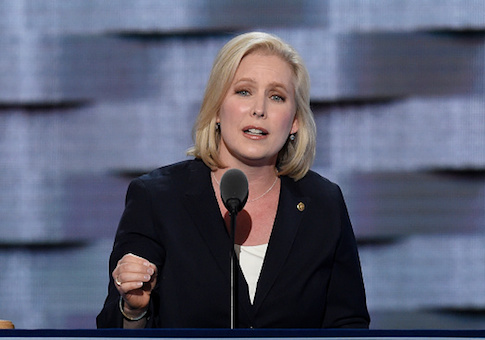 Sen. Kirsten Gillibrand (D., N.Y.) took another shot from a New York editorial board Tuesday for misleading voters about her presidential ambitions while running for reelection to the Senate last year. The editorial board for Advance Media NY, which manages the Syracuse Post-Standard, blasted Gillibrand for lying to New Yorkers when she claimed she would serve a full six-year term upon being reelected to her seat last November. Gillibrand, after making that pledge, quickly changed course after her election when she said she would take a look at running for president. She officially announced her bid last week with the formation of a presidential exploratory committee. "Because the truth matters, and honesty is a virtue we value, we shouldn’t let the president’s falsehoods slide – nor those uttered by the candidates who want to replace him," the board wrote. "Sen. Kirsten Gillibrand, we’re looking at you." The board said Gillibrand should have side-stepped the question rather than tell a "white lie" and castigated her for depriving New York voters "of important information before they cast their ballots." It noted her well-established flip-flops on major issues in office as further damage to her trustworthiness. "It is an inauspicious way to begin a presidential campaign, inviting scrutiny of the senator’s previous flip-flops on issues like gay marriage, gun control and sexual misconduct by powerful men," the board wrote. "Finally, it further cheapens public discourse at a moment when Americans desperately need and want their leaders to elevate it." The Buffalo News editorial board similarly ripped Gillibrand last week for breaking her promise, saying she "flat-out lied." It noted she can still keep her promise to serve her full term by failing to reach the White House. It's a common white lie for politicians. Then-Illinois Sen. Barack Obama said in 2006 he would not run for president in 2008, but a year later, he announced his eventually successful bid for the White House. Gillibrand's fellow candidate Sen. Elizabeth Warren (D., Mass.) said several times over the last two years she would not run for president. Unlike Gillibrand, she changed her tune before her Senate reelection in 2018 and said she would take a look at it. This entry was posted in Politics and tagged 2020 Election, Barack Obama, Elizabeth Warren, Kirsten Gillibrand. Bookmark the permalink.